Map of Texas Transportation Routes, circa 1880. Courtesy of the Portal to Texas History. Image available on the Internet and included in accordance with Title 17 U.S.C. Section 107. Brown & Tarbox Advertisement for the Texas United States Mail Line of Stages and the Western United States Mail Line of Stages, 1847. Image available on the Internet and included in accordance with Title 17 U.S.C. Section 107. STAGECOACH LINES. 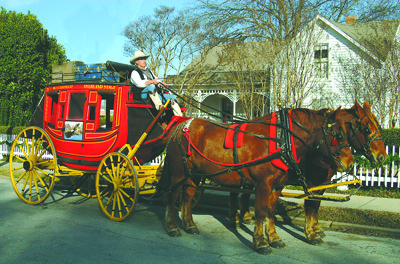 Stagecoach operations in Texas, as in other states, were closely tied to government mail contracts. These contracts provided the solid financial base that also allowed stage companies to transport passengers and freight. 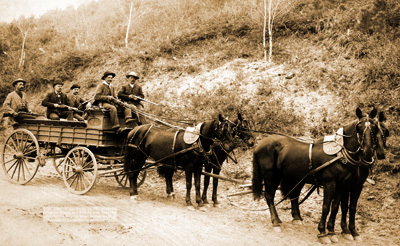 Stagecoach routes provided a nineteenth-century network making travel or mail delivery possible to all communities. Postal routes were first established by the Permanent Council of the Provisional Government in the fall of 1835. The original fifteen routes were mostly between the more populated communities of Central, South, and East Texas. Many of these early routes were served by individuals on horseback. Early stage lines were short, such as the line from Houston to Harrisburg in 1837. Houston had become the population center from which many of the early routes westward began, and by May 1839 a stage line was operating between Houston and Washington-on-the-Brazos. Later that year a line from Houston to Egypt via Richmond and another line between Houston and Austin began operation. Selma Stagecoach Stop and Post Office, pre-restoration, on the Harrison and McCulloch stage line route. Courtesy of the Texas Historical Commission. Image available on the Internet and included in accordance with Title 17 U.S.C. Section 107. Men carry weapons on a stagecoach transporting gold from Wells Fargo, 1890. Courtesy of the Texas Almanac. Image available on the Internet and included in accordance with Title 17 U.S.C. Section 107. 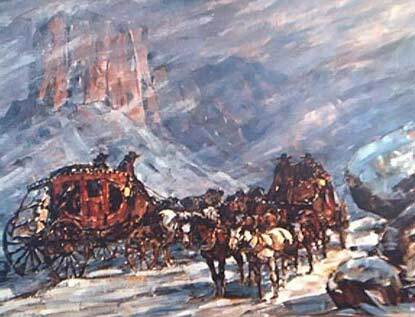 Stagecoach travel was fraught with danger from bandits and hostile Indians. This was especially true in "frontier" areas such as the country around San Antonio and Austin. Stage owners regularly reported thefts of mules and supplies, destruction of way stations, and murders of drivers, guards, and passengers by Indian raiding parties. Even so, new stage lines were being added every year as the growth in the state's population resulted in the westward expansion of the frontier and in the establishment of new towns along the stage routes. Portrait, William A. A. Bigfoot Wallace. Courtesy of the Austin Public Library and the Portal to Texas History. Image available on the Internet and included in accordance with Title 17 U.S.C. Section 107. There was also an increasing demand for stage service westward, due in no small part to the California gold rush. On September 20, 1851, Henry Skillman was granted a contract to provide mail service from San Antonio to Santa Fe via El Paso. The first San Antonio-El Paso Mail stage departed on November 3, 1851. One of Skillman's drivers was the famous William A. A. (Bigfoot) Wallace. In April 1854 Skillman's contract was revoked and a new contract awarded to David Wasson. However, the latter failed to deliver, and the contract was transferred later that year to George H. Giddings, in partnership with Skillman. During these years Indian raids resulted in destroyed stations, lost mail, and the killings of station hands, stage guards, drivers, and passengers. Giddings and Skillman suffered financial losses but won increased compensation from the Post Office Department. They were still operating when, on June 22, 1857, a contract was granted to James Birch for service from San Antonio to San Diego, California, via El Paso, part of which duplicated Giddings's route. After Birch's death at sea Giddings bought the contract and continued service until the El Paso to Fort Yuma portion of the contract was terminated in October 1858. A restored Butterfield Overland stagecoach from 1880. Courtesy of the Texas Almanac. Image available on the Internet and included in accordance with Title 17 U.S.C. Section 107. Butterfield Overland Route Map, spanning from St. Louis and Memphis to San Francisco, 1858. Courtesy of the Library of Congress and USPS. Image available on the Internet and included in accordance with Title 17 U.S.C. Section 107. Painting, the first Butterfield Overland Mail stagecoach passes through the Guadalupe Mountains, 1858. Courtesy of the National Park Service. Image available on the Internet and included in accordance with Title 17 U.S.C. Section 107. One of the most famous stagecoach operations in Texas was the Butterfield Overland Mail. California settlers, unhappy with the time required for mail from the East to reach them via Panama, demanded quicker service, namely an overland stage route to the west coast. As a result, on April 20, 1857, the Post Office Department advertised for bids on a new route to California. The contract was awarded on July 2, 1857, to a well-financed group headed by John Butterfield of Utica, New York, who agreed to run a southern route through El Paso. Such a route was favored by Postmaster General Brown because it could provide year-round service as opposed to mid-continent and northern routes, which would be shut down in winter months due to heavy snows in the mountain passes. Butterfield's route headed southwest from St. Louis and Memphis, crossing the Red River at Colbert's Ferry in Grayson County and continuing across Texas for 282 miles to Fort Chadbourne via Jacksboro, Fort Belknap, and Fort Phantom Hill. The next 458 miles to El Paso swung south across a barren plain between the Concho and Pecos rivers, where water was in short supply, past Horsehead Crossing on the Pecos, up the east bank to Pope's Camp, where it crossed the river, hugged the west bank northwestward to Delaware Spring, and then turned westward through Guadalupe Pass to Hueco Tanks and El Paso. The line continued westward through Tucson and Fort Yuma to San Diego. The company built stations every twenty miles along the route and drilled water wells where needed to ensure an adequate supply. Relief mules were kept at the stations, but they were often stolen or driven off by Indians. The first Butterfield stages began the eastbound run on September 15, 1858; the westbound began on September 16. Travel time from St. Louis to San Francisco averaged less than the required twenty-five days, including eight days across Texas. The line was highly praised for its dependable service. However, at the beginning of the Civil War, on March 2, 1861, the United States Congress passed legislation that transferred the Butterfield line from Texas to a more northern route. The Confederates seized all the Butterfield stations and many of the coaches. Thus, a spectacular episode in the stagecoach history of Texas ended. 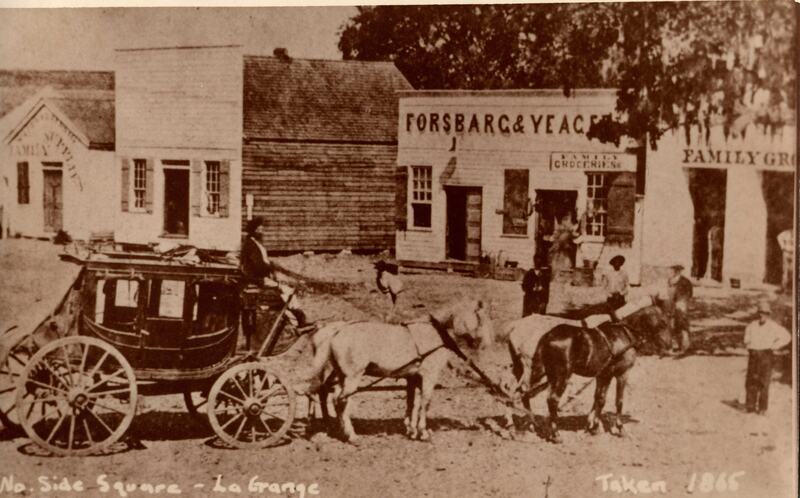 Sawyer and Risher Stagecoach in La Grange, 1865. Courtesy of the City of La Grange. Image available on the Internet and included in accordance with Title 17 U.S.C. Section 107. Map of the Cotton Road, circa 1860s. Image available on the Internet and included in accordance with Title 17 U.S.C. Section 107. At the beginning of the Civil War there were thirty-one stage lines operating in Texas. Except for the Butterfield and San Antonio-El Paso stage lines, the population centers that these lines served were primarily in the eastern half of the state. There was a route northward from San Antonio through New Braunfels, Austin, Waco, Waxahachie, Dallas, and Clarksville, operated by Risher and Sawyer (see RISHER AND HALL STAGE LINES). A mail route from Dallas to Fort Belknap through Weatherford made two trips a week. Other routes included a Clarksville to Waco run through Bonham, McKinney, Dallas, and Waxahachie every other day and a triweekly stage between Dallas and Palestine. Many future communities had not yet been established, so these lines formed a fairly complete network. Some lines continued to operate after the outbreak of hostilities by signing contracts to carry mail for the Confederate states. Although the Confederate government did not have the wherewithal to sustain mail contracts in the manner of the United States Post Office Department, several Confederate States Mail stage lines operated on regular schedules out of San Antonio and other important Texas communities. A steady Confederate stage traffic plied the "Cotton Road" between Matamoros-Brownsville and the railhead at Alleyton. Southern cotton was exchanged at Matamoros for necessary war supplies brought by ships from Europe. Mail Line Advertisements, 1864. Image available on the Internet and included in accordance with Title 17 U.S.C. Section 107. In the years after the Civil War hundreds of United States mail contracts for Texas routes were let. Many were for relatively short routes between small towns, and there was stage service to nearly every Texas community. Often the same individuals bid on several contracts because long routes were bid in segments. Bidders often stipulated "four-horse coaches" or "two-horse hacks." Contracts called for biweekly, triweekly, or more frequent service and specified the day and hour for departure, arrival, and return. In January 1866 a German immigrant named August Santleben obtained a United States mail contract for service from San Antonio to Eagle Pass continuing into Mexico. He later wrote a book about his stagecoach experiences. In April 1866 Bethel Coopwood began service between San Antonio and El Paso, but control of the line passed to Benjamin F. Ficklin in 1867. After Ficklin's death in March 1871 the contract for this service was awarded to his partner, F. P. Sawyer of Washington, D.C., when the low bidder failed to commence service within the required time period. Sawyer operated the line through June 1875. Stagecoaches leaving San Antonio in 1877, the same year the railroads came in. Courtesy of the Texas Transportation Museum. Image available on the Internet and included in accordance with Title 17 U.S.C. Section 107. The coming of the railroads signaled the end of the stagecoach era in Texas. Stage lines continued to operate from railheads into frontier areas not yet reached by rail and continued to serve bypassed rural areas. One of the last of the great Texas stagers was C. Bain and Company. Charles Bain's company operated from early 1876 into the 1880s with a route from San Antonio to Fort Concho, connecting with another Bain line from Ben Ficklin to El Paso and Mesilla, New Mexico. Bain also operated stages between San Antonio and Laredo. However, Bain and other stage operators realized that the railroads would eventually put the stage lines out of business by winning the mail contracts. By the early 1880s the stagecoach era was essentially over, although there was some stage service in rural areas past 1900. Through the years new settlements sprang up along the stage routes and near the military posts that guarded the routes. Thus, the stagecoach era can be regarded as an important factor in the development of Texas. Mail lines were run into sparsely settled and even uninhabited areas, where it was hoped that this service would spur settlement. Wayne R. Austerman, Sharps Rifles and Spanish Mules: The San Antonio-El Paso Mail, 1851–1881 (College Station: Texas A&M University Press, 1985). Alex L. ter Braake, Texas: The Drama of Its Postal Past (Fredericksburg, Maryland: American Philatelic Society, 1970). Viktor F. Bracht, Texas im Jahre 1848 (Iserlohn, Westphalia: J. Bädeker, 1849; trans. C. F. Schmidt, San Antonio: Naylor, 1931). Dallas Morning News, September 27, 1931. LeRoy R. Hafen, Overland Mail, 1849–1869 (Cleveland: Clark, 1926). Harry M. Konwiser, Texas Republic Postal System (New York: Lindquist, 1933). David L. Nickels and José E. Zapata, et. al., Archeological Testing at the Selma Stagecoach Stop and Post Office (41BX1409), Bexar County, Texas (San Antonio: Center for Archaeological Research, University of Texas At San Antonio, Archaeological Survey Report, No. 307, 2005). Waterman L. Ormsby, The Butterfield Overland Mail (San Marino, California: Huntington Library, 1942; rpt. 1955). Registers of Star Route Contracts, National Archives, Washington, D.C. August Santleben, A Texas Pioneer (New York and Washington: Neale, 1910). Robert H. Thonhoff, San Antonio Stage Lines, 1847–1881, (El Paso: Texas Western Press, 1971). Vertical Files, Dolph Briscoe Center for American History, University of Texas at Austin. Handbook of Texas Online, Rex H. Stever, "STAGECOACH LINES," accessed April 21, 2019, http://www.tshaonline.org/handbook/online/articles/ers01.